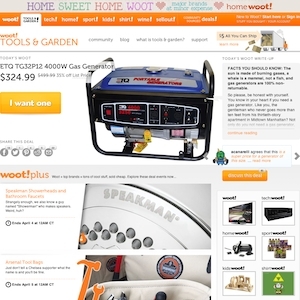 On April 1st 2013 Woot announced a new site called "Woot Tools & Garden" in addition to the main Woot site and the other Woot sites that already exist. "There are a lot of ways to look at it. You could say Tools & Garden is about building your space and Home is about how you live in that space. You could say Tools & Garden sells hard stuff and Home sells soft stuff. You could say Tools & Garden sells discarded avocado pits and Home sells custom oil-paint portraits of your dolls, but in that case you'd be wrong." So there you have it Woot Tools & Garden is ALIVE! Tools.woot.com currently ranks #12 amongst sites offering online deals -- DX Offers ranks #11. In the Home and Garden category, Tools.Woot ranks at #2 -- Home Depot ranks #1. Tools.Woot is considered the most popular deal a day site, ranking in at #1. As for the 2nd most popular site, it's Giveaway of the Day. Offers daily deals on tools. Copyright © 2019 Trackdailydeal.com All Rights Reserved.